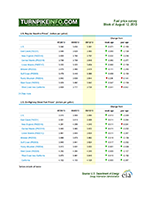 Download the weekly EIA gas price survey. The price of gas went into a near freefall during the past week, with many regions of the United States enjoying some of the lowest prices of the year. The biggest decline in prices came for the Midwest, where the average price of a gallon of unleaded plunged nearly 12¢ per gallon to just under $3.20. Across the Gulf Coast, the price of gas is near the $3.00 mark, the lowest regional average in the country. For the broader, nationwide average, the price of unleaded stands, officially, at about $3.29 per gallon, a drop of nearly 7¢ over last week, according to the latest survey from the Energy Information Administration. One area where drivers are still experiencing higher gas prices is across the West Coast and California. Gas price averages in some areas are more than 30¢ above the national average, with a trip up the Pacific Coast Highway likely to set you back about $3.61 per gallon. Most Westerners, however, are paying about $3.42 per gallon; drivers across the Rocky Mountain states are divvying up slightly less, at $3.37 per gallon, on average. The price of shipping goods over land has also become a little less expensive, with the price of diesel fuel dropping about 2¢ per gallon during the pas week. 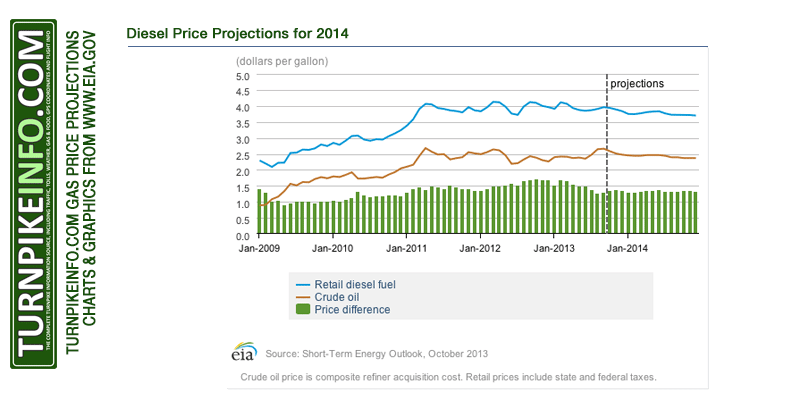 Overall, however, diesel prices are lagging regular gasoline in price declines. The average price of diesel remains in the high $3.80’s, with prices in some areas across the West Coast still well north of $4.00 per gallon, particularly in California. However, the current price trend is likely to continue, and that will bring further relief to regular drivers as well as truckers, going forward. As the price of crude oil continues falling, the retail price at the pump will follow suit, typically within a couple of months. However, crude prices have been mixed in recent weeks. West Texas Intermediate (WTI) is now well off it’s yearly highs, closing Tuesday at $97.46 for December delivery. However, Brent Light Sweet Crude remained well above the 100-dollar threshhold, primarily because of unrest in Libya this week. That political instability has shaken markets, but it has not caused a run-up in fuel prices like investors witnessed in August, when concerns in both Libya and Syria drove speculation of supply disruptions. Even so, the EIA has predicted the winter driving season will begin with gas prices at their lowest levels of the year. The EIA is further forecasting gasoline prices to continue falling into 2014, with a brief uptick in January, which is normal for the start of a calendar year. Perhaps the best news for 2014 projections is for the truckers. Diesel prices, which have hovered near or above $4.00 per gallon for the past two years, are projected to finally fall to around $3.76 per gallon, on average, in the coming calendar year. However, those projections are subject to considerable fluctuations due to supply and demand issues, particularly where it concerns refinery capacity and the potential for supply disruptions during the winter.